Since Al-Hayat (The meaning “life” in Aarabic) school was targeted in government forces air strikes on November 5, 2014 resulting in the death of over a dozen students, the school moved to an underground location for security reasons. 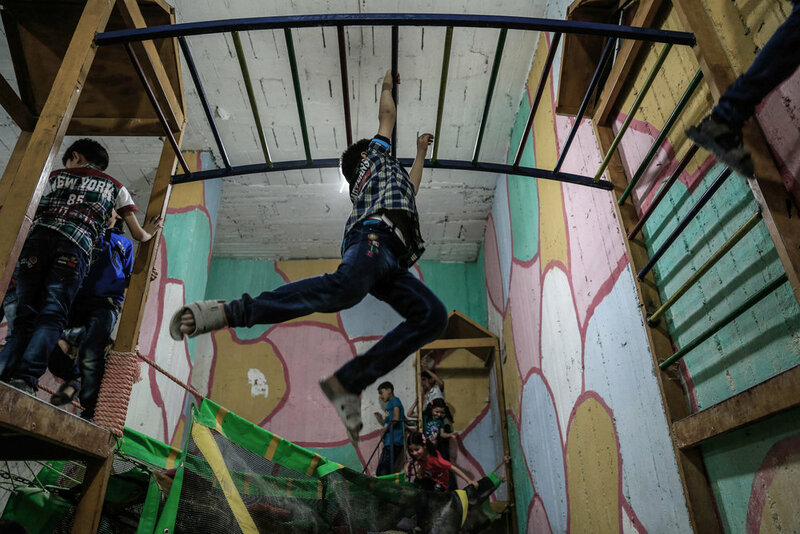 The pictures above show children attend a class in one of the underground rooms of the Al-Hayat school in Damascus' north eastern rebel-held al-Qaboun suburb, which was under a truce with the regime, on October 19, 2016. A group of women work at Al-Amal al-Moushriq sewing centre in the city of Douma, on the eastern outskirts of the capital Damascus, on March 7, 2017. Markets also moved into underground location for protection in case of bombardments. 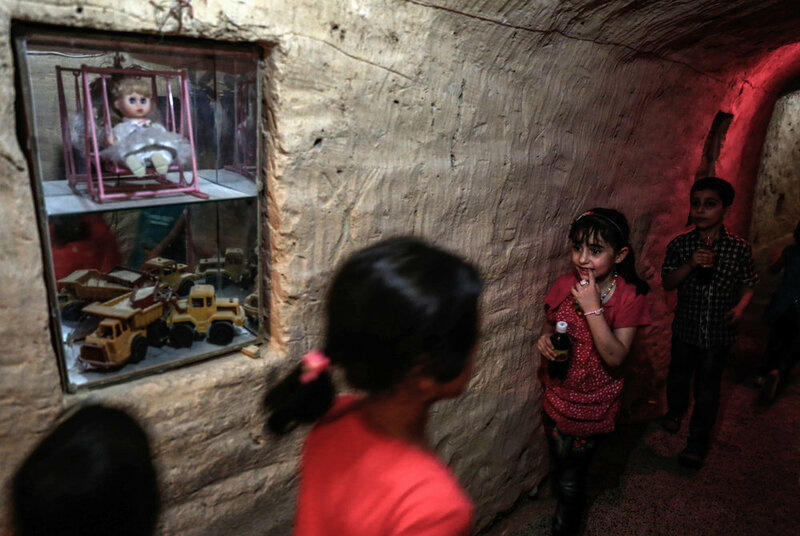 Children play in an underground playground built to protect them from shelling in the rebel-held town of Erbin, east of the capital Damascus, on July 7, 2016 during Eid al-Fitr, which marks the end the Muslim holy fasting month of Ramadan. People started digging shelters to protect themselves in cases of bombardments. Abu Omar, with the help of his neighbors, was able to dig and prepare an underground shelter consisting of a single room in the space of 2 weeks. The shelter is 4 meters below ground and has an air vent for emergencies. A traditional wedding for people who lost some of their limbs during the war, this wedding held in an underground place for security reasons. 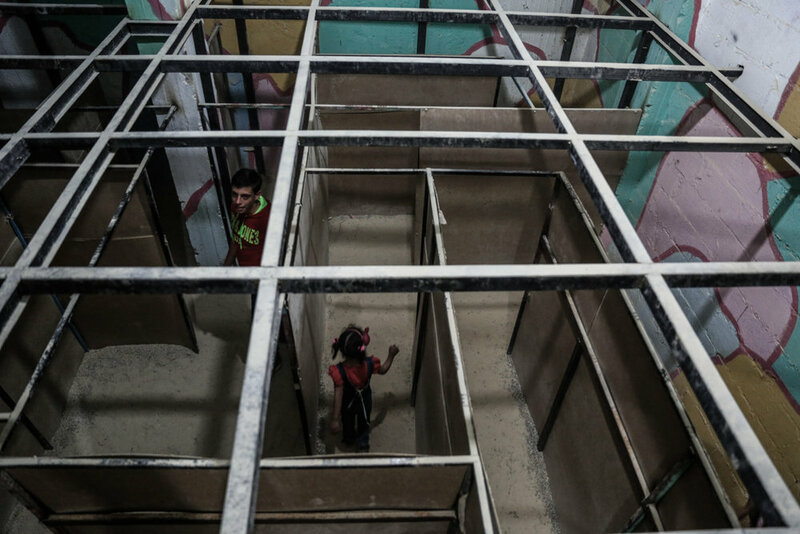 People cast their votes in an underground basement during the election of the local council in the city of Douma in Eastern Ghouta. 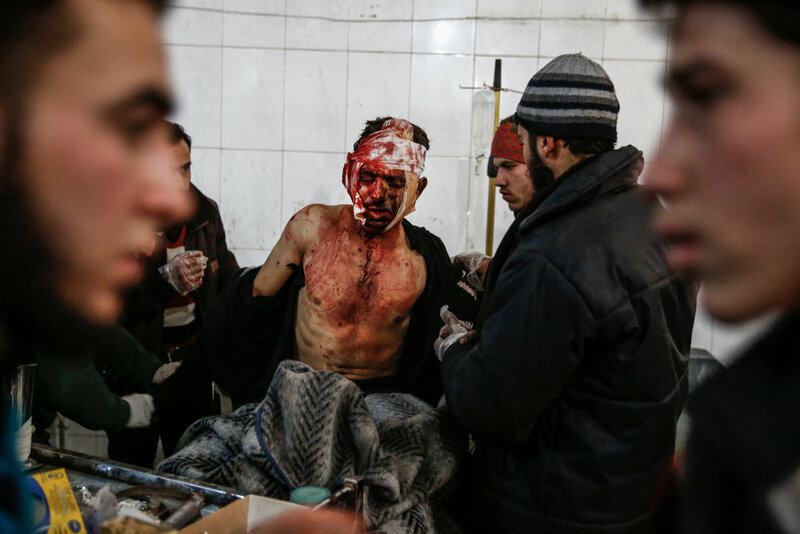 A man wounded in an air strike by Syrian government forces on Hammuriyeh receives treatment at an underground field hospital on December 24, 2015. Patients with kidney failure receive treatment in the basement-turned-clinic in the city of Douma, on March 16, 2017. Maya, a 4-year-old Syrian girl, lies in an underground hospital bed after she was injured the day before following air strikes by Syrian government forces on a marketplace in the city of Douma, on August 17, 2015. Men gather to bury the bodies of a family in the city of Douma. The family, made up of two boys, their mother and their grandmother, were killed during shelling by the Syrian government forces as they were having a picnic. A picture shows the bodies of people who were killed during the shelling lying down in an underground morgue. A picture shows a body of a dead man lies in an underground morgue.